A question commonly asked by e-commerce sellers is what is deductible on a business tax return. The key to understanding what is and isn’t deductible is whether or not an expense is ordinary and necessary. 1 - Are family vacations deductible? There is a tendency in the e-commerce community to think it is allowable to take a family vacation to an amusement park, and as long as the seller sources inventory in the park, or on the way to and from the park, the entire trip for the entire family is deductible. Sellers regularly share online articles with me about “How to Expense your Entire Family Vacation,” or “Six Ways to Write Off Your Next Family Vacation.” Yes, those articles are out there but the suggestions in those articles could possibly get you in trouble. Remember, if it’s too good to be true, it probably is. However, PLEASE do not get tax advice from the internet; be sure your CPA that you have engaged to prepare your tax return is assisting you in determining taxable eligibility for expenditures. There is no telling what the IRS will flag, so please do not try to reduce your taxable income with expenses that are not legitimate. If you are unsure, ask your CPA. 2 - What about entertainment expenses? Can I deduct those? The 2017 Tax Reform Act signed on December 22, 2017, will apply to the 2018 tax year. The new tax act establishes additional limitations on the deductibility of certain business meals and entertainment expenses. Under the act, entertainment expenses incurred or paid after Dec. 31, 2017 are nondeductible unless they fall under the specific exceptions in Code Section 274(e). In other words, entertainment expenses were possibly eligible for deduction in 2017, but in 2018, entertainment expense is no longer deductible. 3 - Can I deduct gifts for employees? Many sellers are generous and want to acknowledge or reward their employees with gifts. Some sellers are under the mistaken impression, by doing so, they can take a deduction on their books for the expense with no revenue consequence to the recipient. They also mistakenly think there is no limit to the business deduction allowable. Also remember that a gift to an employee is taxable to the employee. 4 - What kind of documentation do I need for deductible expenses? The primary requirement is that you must have adequate evidence. While a receipt from purchase or invoice is typically substantial, the IRS is very specific about what documentary evidence is required for travel and entertainment expenses. The document/invoice/receipt should show the amount, date, place, and essential character of the expense. 5 - What are examples of expenditures that are not allowable as deductions? You cannot take a deduction for meals when no business was conducted, potentially night clubs and cocktail loungers, country clubs, theaters, athletic and golf clubs, sporting events, and/or hunting, fishing, or similar trips. Hopefully you are not still confused! Remember, if it was possible to take a business deduction for family vacations, limitless entertainment, and other “fun” things, everyone would start a small business to do so. It is not possible to deduct an entire family vacation, entertainment, gifts or anything that is not ordinary and necessary. If you are unsure, do not guess. Ask your CPA. You do not want the effort to reduce taxable income to result in an audit. While there are certainly gray areas, let your conscience and your CPA be your guide! 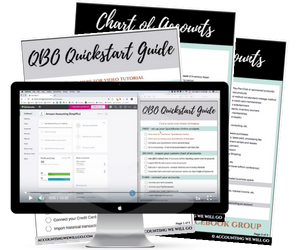 Most importantly, if you haven’t begun to manage your accounting, or if you’ve fallen behind and don’t know how to get organized, enter your information below to download our FREE QBO Quickstart Guide to get you started using QuickBooks Online, including a video tutorial and Chart of Accounts specific to your Amazon business.